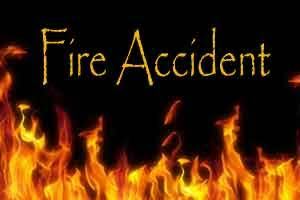 Uttar Pradesh: A fire accident was reported recently at the government run Veerangana Jhalkari Bai child and women hospital in Hazratganj. Even worst is the fact that ten newborns were reported to be in the Neonatal Intensive Care Unit (NICU), where the incubators and photo therapy units became dysfunctional-following this incident. Ten newborns had a narrow escape when fire broke out at the government run Veerangana Jhalkari Bai child and women hospital in Hazratganj on Wednesday night, rendering the Neonatal Intensive Care Unit (NICU) with incubators and photo therapy units dysfunctional. The cause of the fire as per the initial investigations of the police has revealed that fire started at 9pm because of a short circuit at the store on the first floor of the hospital. Only within next 15 minutes it spread to neo-natal ICU creating a panic situation. A chaotic situation followed at the hospital as people rushed after wards and rooms were filled with smoke. In the interim, the power supply also got disconnected.